One of the best parts of doing what we do at Universal Plastic Mold is getting to provide a solution for our customer’s needs. It’s both an honor and a responsibility, and not one we take lightly. We know that achieving the full potential of our capability directly affects the capabilities of the companies we provide solutions for, so we take it seriously when a company trusts UPM enough to help bring its idea to life. A real pleasure for us is getting to work with companies that are starting at the beginning with an idea that we’re able to participate in creating. Getting to partner with these innovative companies to bring form to something that hasn’t yet existed requires all our creativity and skill and is a full team effort, which we experienced with our latest partner when we took on the task of helping produce a state-of-the-art mall kiosk by Norwegian company BubblyGroup. BubblyGroup’s product, called Bubbly®, is the latest concept in consumer feedback collection. Put simply, Bubbly is a highly designed kiosk intended for store use, particularly malls, to collect real-time customer surveys from consumers in the store. The motivation for the store is to gather market research about what consumers want and need so they can better tailor their products. Consumers agree to participate because Bubbly rewards each survey taker with a prize of some sort, as well as coupons based on what they identified with being interested in. 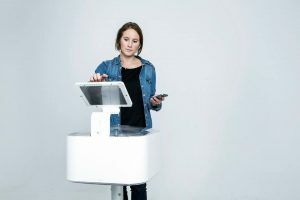 BubblyGroup spent considerable time testing the kiosk in Scandinavian countries with great success, enough to move their headquarters to New York, where they’re now planning to launch Bubbly in American retail locations. BubblyGroup came to us, ultimately deciding to partner with us after seeing the size of our machines, the capability of our facility, and our commitment to customer service. They also related to being a family owned company, as they are as well, so we hit it off quickly and shared enthusiasm in getting the product to market. They brought us a prototype initially, and our designers modified it slightly to make it more suitable for injection molding. We collaborated until we found a design we were all happy with and got to work making several parts ranging in size. Essentially, our role was needing to build the majority of the kiosk itself so that it was both functional and attractive in retail locations. Our partnership with BubblyGroup has been exciting and creatively inspiring, and they’re planning to have 300 units out for beta testing by October 2017. The Bubbly kiosk is expected to become a popular, widespread means of improving customer satisfaction through immediate consumer feedback, converting store visitors into buyers. Larger production is expected not too far in the future, and the company received acclaim for being a finalist in the 2016 national level Nordic Startup Awards. UPM is pleased with the parts we were able to build, and we wish BubblyGroup much success with the Bubbly product.